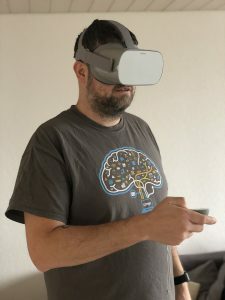 On Black Friday sale I ordered my first VR Headset, an Oculus Go (64GB) for 222.- CHF (about 222 US $), in my opinion a good deal for my first step in the word of virtual Reality. The Oculus Go is a very entry level VR with the benefit that you don’t need an additional Computer. The integrated hardware with an Android OS does all the work. But this article will not be a review of the Oculus Go as there are many others already available. Usually you use your Oculus Go with the apps in the Oculus store, but there is a known trick to load also other Android Apps to the oculus, called “Sideload” and Android application. You need to setup your Oculus in Developer mode and then you are able to add APK files to the oculus. After that unsuccessful try to launch a virtual desktop, I tried to play around with sideloading other apps. I found out that the app Kodi and ES File Explorer appears in the Oculus Tv app in the section other sources. Both applications can be used to see and start other Android apps installed on the System. It’s pretty easy to setup an Oculus Go to run with the Citrix Workspace app, and the Oculus Go is an affordable VR headset. This is a cool tech demo, but not sure if I want to work long time in a Oculus Go provided VR because this headset is really entry level. Assume headache and “VR fatigue” comes fast. Also, I miss a real Keyboard in VR. But with Augmented Reality or Mixed Reality I think it can be a solution on future to work with a virtual virtual Workplace! If you are not yet “jumped” in the VR World I can really recommend the Oculus Go 64 GB as the first VR Headset. You can buy it on your local electronics store or on Amazon.